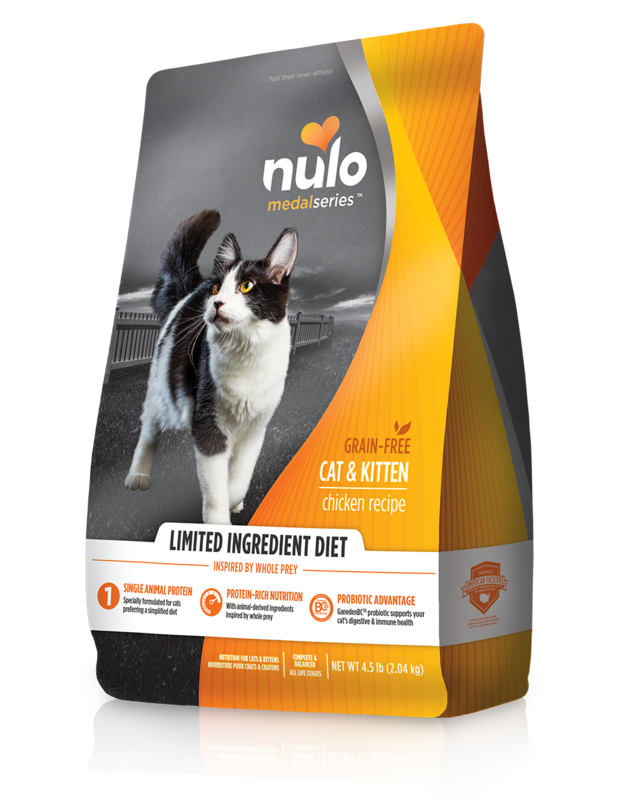 Proper and tasty nutrition for your cat doesn’t have to be complicated thanks to Nulo’s Whole-Prey Inspired Limited Ingredient Diets. With Chicken as the single animal protein source, you can be confident that your cat is receiving the highest quality nutrition, while also enjoying a more simplified diet. Paired with nutrient-rich organ meats like Chicken Hearts & Livers, and collagen-rich Chicken Cartilage, this unique recipe will satisfy your cat’s appetite and give them benefit of whole-prey ingredients — as nature intended. Specially formulated for pets preferring a simplified diet. Contains ultra-rich protein & balanced fat levels inspired by prey. A texture & taste cats love. High-quality proteins provide amino acids that support lean muscle mass and a healthy heart. Contains a high quality source of Non-GMO, expeller-pressed canola oil. Deboned Chicken, Chicken Meal, Yellow Peas, Green Lentils, Chicken Fat (preserved with Mixed Tocopherols & Citric Acid), Whole Flaxseed, Miscanthus Grass, Chicken Hearts, Chicken Livers, Natural Chicken Flavor, Salmon Oil, Chicken Cartilage, Salt, DL-Methionine, Dried Chicory Root, Dried Cranberries, Dried Kelp, Dried Sweet Potatoes, Calcium Carbonate, Taurine, Potassium Chloride, Yucca Schidigera Extract, Choline Chloride, Zinc Proteinate, Vitamin E Supplement, Zinc Sulfate, L-Ascorbyl-2-Polyphosphate (source of Vitamin C), Iron Proteinate, Niacin Supplement, Ferrous Sulfate, Copper Proteinate, Copper Sulfate, Vitamin A Supplement, Manganese Proteinate, Thiamine Mononitrate, Calcium Pantothenate, Riboflavin Supplement, Pyridoxine Hydrochloride, Manganous Oxide, Biotin, Dried Bacillus coagulans Fermentation Product, Vitamin B12 Supplement, Vitamin D3 Supplement, Folic Acid, Sodium Selenite, Calcium Iodate, Rosemary Extract. MedalSeries Limited Ingredient Cat & Kitten Chicken Recipe is formulated to meet the nutritional levels established by the AAFCO Cat Food Nutrient Profiles for all lifestages. A cat’s requirement may vary from the guidelines below due to age, breed, environment and activity level. Adjust food as required to maintain optimal body weight. Always provide plenty of clean, fresh water and hugs. * For adults over 15 lb, feed 1 cup +¼ for each 4 lb. Pregnant or nursing mothers may require up to three times the amounts shown. Ask your veterinarian if you’re unsure.